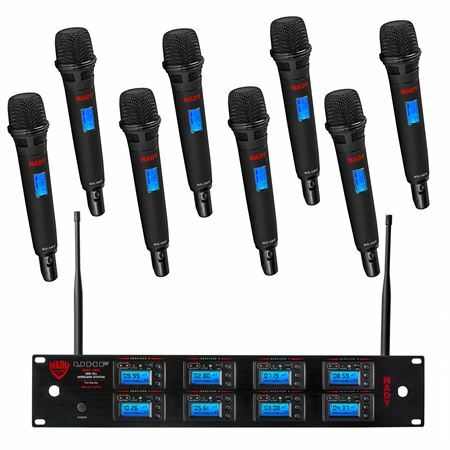 Order your Nady 8W1KU HT 8 Channel Handheld UHF Wireless Microphone System Band 3 from AMS and enjoy 0% Interest Payment Plans, Free Shipping, Free Extended Warranty & 45 Day Money Back Guarantee. 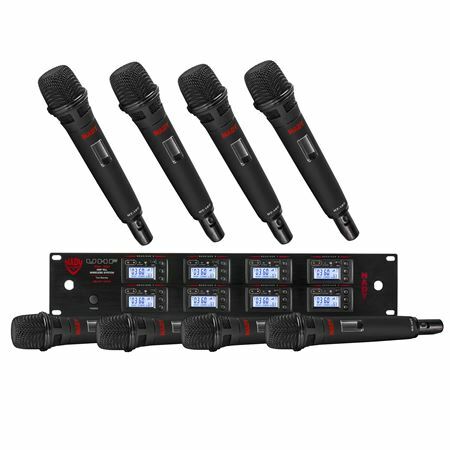 Providing up to 8 simultaneous transmitters, the 8W-1KU handheld wireless system features a clear, powerful sound with maximum feedback rejection and minimal handling noise. The 8W-1KU is a full-features 1,000 channel select UHF wireless system for the most demanding applications. Frequency agile operation and clear channel interference free performance. Eight independent wireless receivers in one enclosure for simultaneous operation of eight - transmitters. Unsurpassed performance with 120dB dynamic range. True Diversity circuitry for worry-free operation and dropout protection. Up to 500’ range. 1000 selectable UHF frequencies (520-544.975 MHz range) per transmitter for interference-free reception with AUTO-SCAN feature for easy location of clear channels and ASC (Auto-Sync Channel) infrared download for easy frequency synchronization. 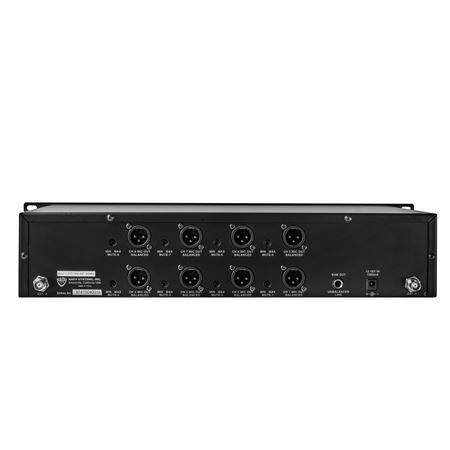 Rack-mountable receiver with 8 balanced XLR microphone level and 1 unbalanced ¼” mixed line level audio outputs. Backlit LCD with user-friendly configuration menus indicating frequency, volume, and RF signal strength. All-metal body handheld microphones with the Nady DM-10 neodymium cartridge for clear audio and maximum feedback rejection. 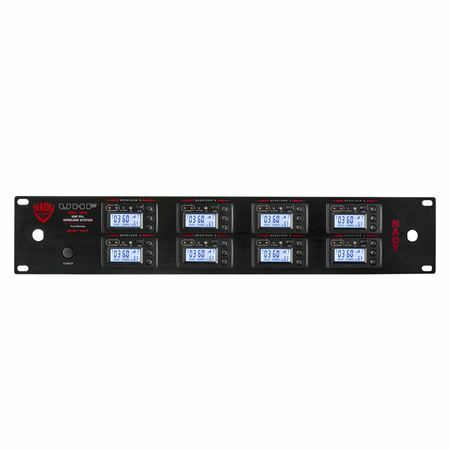 LCD display indicates group, channel, audio level, and battery level status. Operation with two AA batteries.